Is your baby having a dry scalp? Do you know that this problem lies in a lot of babies and is quite common; therefore, you shouldn’t be worried as it has a simple solution. You should just know the exact symptoms of this problem so that you can treat it the way you should. Babies who have dry scalps often show thick yellowish patches on their head. Even if they are bald, you will be able to observe the yellow patches which will show you the dandruff on your baby’s hair. If your baby is having the same problem, it is time for you to solve it. For starters, you should use a bit of olive oil on your baby’s scalp. Try not to use a lot of oil; in fact, pour some on your palm and then use your fingertips in order to massage your baby’s head. Do not apply pressure, as you have to be extremely careful when it comes down to baby’s skin. They are extremely sensitive and you should be extra careful while you are massaging their head. Try to use small, circular motions to massage the baby’s scalp with your fingertips. It has been mentioned to you before, in the description, that the baby’s scalp will show a few yellow patches. Therefore, massaging your baby’s head with oil will not help you remove the dryness completely. Hence, you should purchase a baby brush. They are soft and specifically designed for babies; so, using them on your baby’s scalp will not cause any damage. Grab the brush and softly rub it over your baby’s scalp in order remove all the dandruff and the yellow patches that are on top of it. You should also use baby shampoo on your baby’s scalp. There are shampoos which are specifically designed for baby skin and they do not harm your child at all. 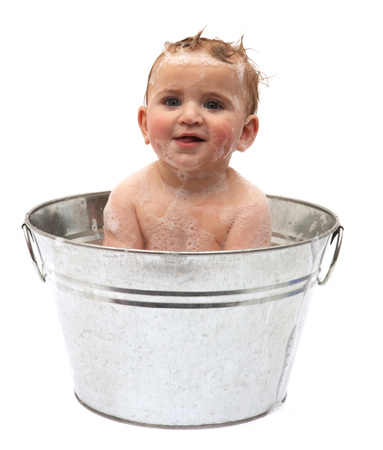 When you purchase the shampoo, use it on your baby’s scalp and when you apply it, do not wash it off too soon. Let it sit for a while so that it moisturizes your baby’s head and the dandruff can be removed for good. Right at the end, when you are shampooing your baby’s hair, apply a little bit of oil so it can act as an extra moisturizer. Oil used during shampooing can really help your child’s dandruff and dryness problems as it stays there for long.